The Calvin Coolidge Presidential Foundation is based at the President Calvin Coolidge Historic Site in Plymouth Notch, Vermont. The Coolidge Foundation’s offices are located on the first floor of the President Calvin Coolidge Education Center. The Foundation is open Monday-Friday from 9:00 AM to 5:00 PM. Please note: the President Calvin Coolidge State Historic Site is open May 26-October 21, 2018, daily, from 10:00 AM to 5:00 PM. The Historic Site is owned and operated by the Vermont Division for Historic Preservation. 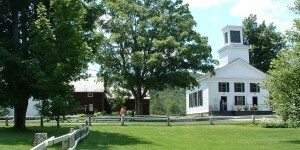 For more information about the Historic Site please visit http://historicsites.vermont.gov/directory/coolidge. 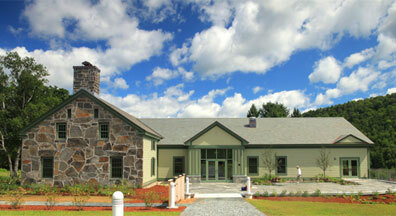 The Coolidge Foundation owns and maintains the Union Christian Church, located at the heart of historic Plymouth Notch. The Church was built in 1840 and dedicated as a Congregational Church in 1842. The building is in the Greek Revival style and the original iron thresholds were cast at Tyson Furnace in Plymouth. In 1900, the interior was redesigned in a Carpenter Gothic style by a local artisan, Willie Pierce. Hard pine for the woodwork was sawn at the local mill. The church is open daily to visitors during the summer season.